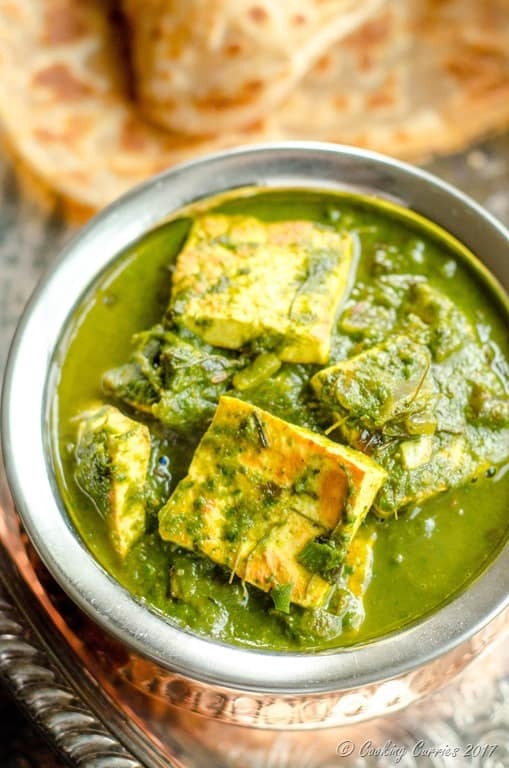 Paneer combined with loads of healthy greens and spices to make it this delectable curry of Palak Methi Paneer. Enjoy this Punjabi favorite with some parathas, naan or rotis. 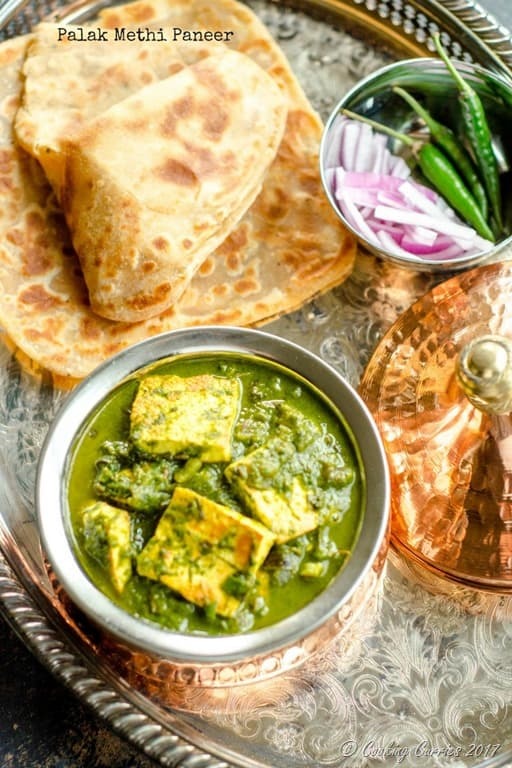 Paneer and greens are meant to be together. 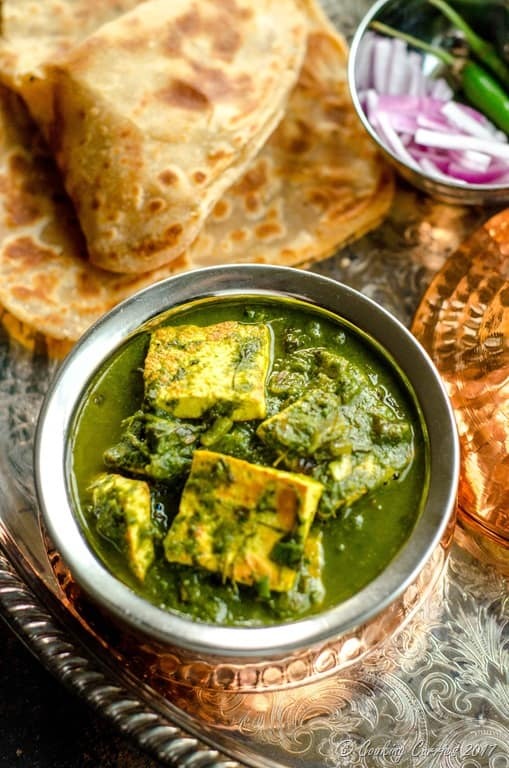 Whether it is saag paneer with mustard greens, palak paneer with spinach, methi paneer with fenugreek leaves or this brilliant combo of Palak Methi Paneer. 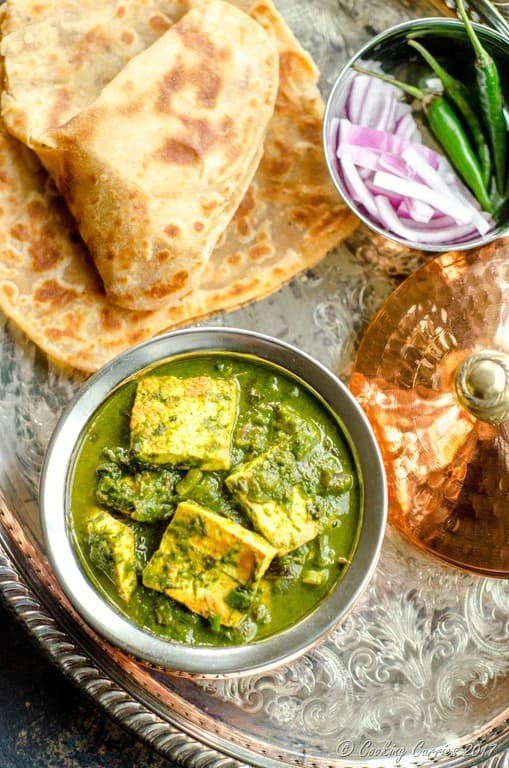 It has the hearty, earthy taste of spinach and that lovely bitterness from the methi, that come together so well with the spices and is a great balance with the creamy paneer. Every bite of it with your favorite flat bread is a party in your mouth. And did I say its super uber healthy. All that goodness of the green leafy vegetables which does not feel all that clunky and chewy like most greens are. Even lil V here loves this dish! This recipe is adapted from Tarla Dalal’s recipe for Palak Methi Chaman. If you love paneer and greens combo, you should totally check out my recipe for Palak Paneer. If you want recipes for just all things paneer, then here are my paneer recipes. Boil some water and add the spinach leaves to it for a couple of minutes. Drain them to a bowl of ice water and drain them again. Puree them with the green chillies, ginger and garlic. Keep aside. Heat the oil in a kadhai and add the cumin seeds to it. Once they splutter, add the onions and saute. Once they soften (dont wait for them to brown), add the turmeric powder, red chilli powder, coriander powder and salt. Add the pureed spinach mix to this. Mix in the kasuri methi and paneer. Let it simmer for a few minutes. Sprinkle the garam masala on top and squeeze the lime. Mix well. Remove from heat and serve hot with rotis, naan or parathas. So nice and I feel better to make. it’s so easy method that you explained. That was real tasty! I added full fat cream and yoghurt to add more fat for a keto version of it.